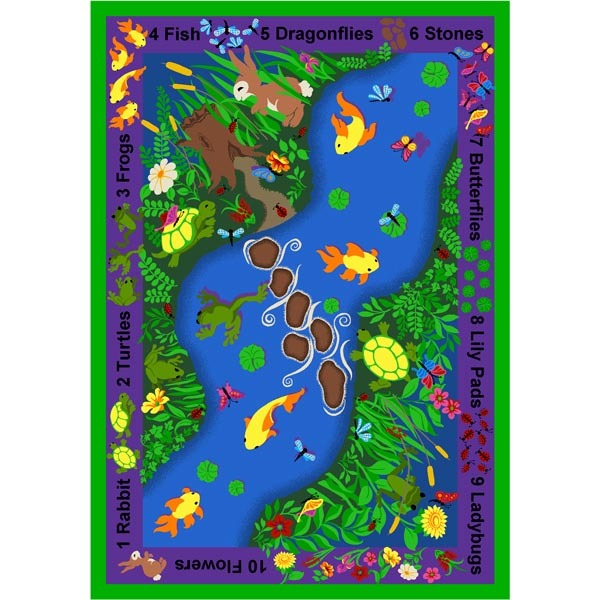 The You Can Find Classroom Rug from Joy Carpets encourages children to match and count the fish, frogs and plants while they sit comfortably. This school rug is constructed of STAINMASTER� carpet fiber with an anti-soil and antimicrobial treatment to protect against everyday spills and germs. And with its SoftFlex� backing system, it will withstand years of heavy use. Dimensions: 5' 4" x 7' 8"
Dimensions: 7' 8" x 10' 9"
Dimensions: 3' 10" x 5' 4"
Dimensions: 10' 9" x 13' 2"
Children will love searching the beautiful scenery of this school rug to find the animals and plants listed around the perimeter. The You Can Find Classroom Rug from Joy Carpets encourages children to match and count while they enjoy a comfortable sitting place. SCHOOLSin carries several shapes and sizes, so you're sure to find the perfect classroom rug for your group or reading area. At SCHOOLSin, there's only one thing we love more than school furniture and equipment -- happy customers. So give us a call at (877) 839-3330 if you have any questions regarding our school rugs. A member of our knowledgeable customer service team will be glad to help.